I began by using Scrapy to download all the e-mails sent to R-help between April 1997 (the earliest available archive) and December 2012. I did not collect all of the data for December 2012. The idea for this project and the scraping took place a long time before the analysis. This produced a total of 318,733 emails. 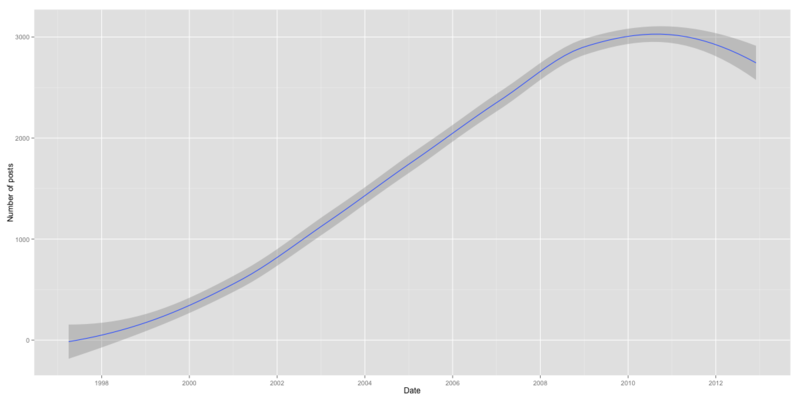 As you can imagine, participation on the list seems to have mirrored the increased adoption of R itself, ranging from 102 posts in April of 1997, to 2144 posts in April 2007, to 2995 posts in November 2012. Number of posts per month between 1997 and 2012. Sentiment analysis is well-known in natural language processing circles as being difficult to do well because of the complexity of language. Things like sarcasm (“Oh, your code is just great! I’m sure you spent hours on it!”), polysemy, and domain- and context-specific vocabularies all make fully automated sentiment analysis a thorny endeavor. However, 300,000+ emails is prohibitive for fully supervised tagging, so, I took a page from Gary King and used the ReadMe package. Fellow Bad Hessian Alex Hanna has also used this package in his own research on social media in Egypt. ReadMe allows users to code a small portion of documents from a larger corpus into a set of mutually exclusive and exhaustive categories. The approach differs somewhat from sentiment analysis procedures developed in computer science and information retrieval which are based on the classification of individual documents. King points out in an accompanying paper [PDF] that social scientists are more often interested in proportions and summary statistics (such as average sentiment) and that optimizing for individual document classification can lead to bias in estimating these statistics. I believe that ReadMe is also the basis for the technology that Crimson Hexagon uses. An example of a response coded -2 would be responses that do not answer the question, along with simply telling the user to RTFM, that they have violated the posting guidelines, or offer “?lm” as the only text when the question is about lm(). Responses coded 0 have no obvious positive or negative aspects or are follow-ups to questions asking for clarification or additional information. That is, they are not helpful in the sense of answering a question but are also not negative in sentiment. Responses coded as a 1 are those responses that answer a question positively (or at least non-negatively). You can quibble with the fact that I have two categories for negative responses and only one category for positive responses, but the goal of the analysis was to determine if R-help was getting meaner over time, not to determine the overall levels of different sentiments. Finally, responses coded as 2 are not responses to questions. This category is needed to make the set mutually exclusive and exhaustive. The vast majority of messages that we coded in this category were questions, although there were a few spam emails as well as job announcements. Proportions of emails in each category in the test set were estimated on a monthly basis. 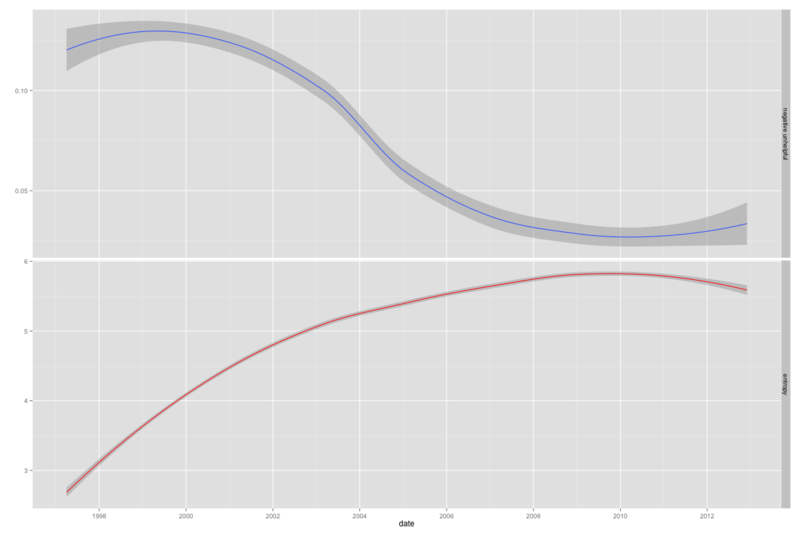 Much to my surprise, R-help appears to be getting less mean over time! The proportion of “negative and unhelpful” messages has fallen steadily over time, from a high of 0.20 in October of 1997 to a low of 0.015 in January of 2011. 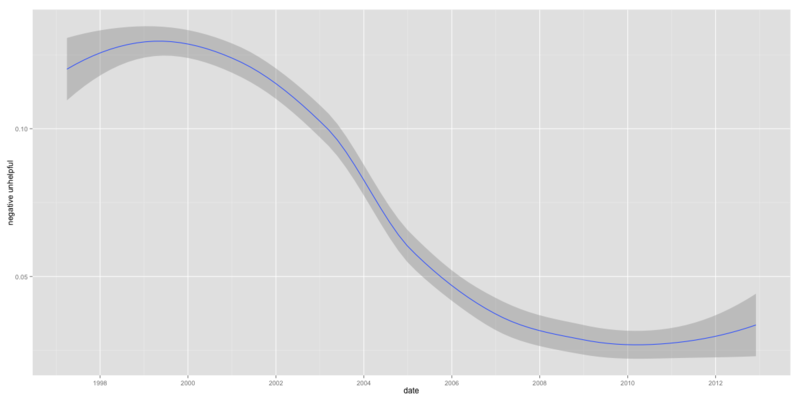 The sharpest decline in meanness seems to have occurred between roughly 2003 and 2008. Even though R-help is getting less mean over time, that doesn’t mean it’s getting nicer or more helpful. Let’s take a look at the proportions for each category of message. These are interesting findings indeed. While the proportion of mean responses, both helpful and not, has fallen over time, so has the proportion of positive and helpful responses. At the same time, the proportion of non-responses and questions have really exploded, comprising more than half of the posts to the list. Simple logic reveals that if more than half of all posts are questions, many questions are going unanswered. I’ll have more thoughts on this in a minute. 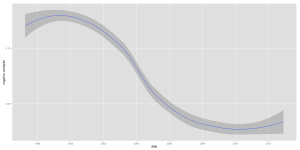 R-help decreasing in meanness over time is surprising. In a discussion on Twitter, Drew Conway and I had the same thought — what if the composition of the user base is driving this change; i.e., what if a cadre of prickly users driving the meanness begin to be outnumbered by kindler, gentler users? 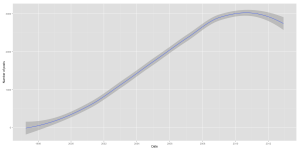 I plotted the “negative and unhelpful” proportions against the Shannon entropy over time. 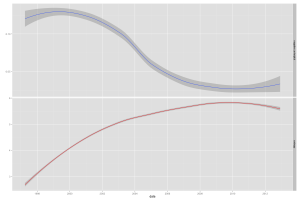 As the R-help (contributing) user base becomes more diverse, the proportion of negative and unhelpful responses decreases. Note that this is a measure of diversity, not of overall size of user base (though that is a consideration). The diversity is estimated on a monthly basis using the number of unique posters that month and the number of emails contributed by each. It certainly makes sense that as the R-help user base expanded into a a more diverse population of generalists and newbies, the proportion of negative and unhelpful posts is bound to fall. Let’s return to the puzzle of falling meanness, somewhat stable helpfulness, and growing numbers of unanswered questions. I think Mancur Olson has something to offer here. R-help is essentially a public good. Anyone can free ride by reading the archives or asking a question with minimal effort. It is up to the users to overcome the collective action problem and contribute to this public good. As the size of the group grows, it becomes harder and harder to overcome the collective action problem and continue to produce the public good. Thankfully, as we’ve seen in a number of free and open source software communities, there is usually a core of interested, alert, and resourceful individuals willing to take on these costs and produce. Maintaining the quality of the public good requires individuals willing to sanction rule-breakers. This was accomplished in early days by chiding people about the content of their posts or generally being unpleasant enough to keep free-riders away. As the R user base grew, however, it became more and more costly to sanction those diluting the quality of the public good and marginal returns to sanctioning decreased. Thus, we get free-riders (question askers) leading to unanswered question and a decline in sanctioning without a concomitant increase in quality of the good. Note: All of the code that I used for this project is available on GitHub. I did not make the messages publicly available because they are all available in the R-help archives, but I did post all of my scraping code. I also did not post the hand-coding of the training set because they are not really that useful without the test set and because the coding contains some non-random sampling of “mean” users. Posted in General, R, Text analysis.Tagged R, sentiment analysis, text analysis. This is cool. The only thing I don’t understand is why there is an uncertainty band around “number of posts per month” in the first figure. Thanks Matt! Two reasons: It’s a loess rather than the raw data, and because I was lazy and used default settings. Nice. It’s a pity this sort of analysis can’t distinguish posts that are actually helpful (eg, accurate) from those that just look helpful but are wrong or misleading. Thanks! Yes, a disadvantage of the method is that it does not produce individual classifications, although building a message-based classifier might be in my near future. If I knew the SO schema better, I’d totally dump all the R answers and comments from http://data.stackexchange.com/ and run this same sentiment analysis with that data. 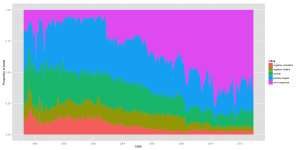 Maybe there’s a connected trend in meanness with users migrating from R-help, or maybe, like you said, they’re nicer because of Olsonian dynamics. Hey Trey, good stuff. Why not remove the “Not a response” category from the analysis? This has been suggested a few times on Twitter. I’m thinking about how to do it. The not a response category needs to be there to make the categories exhaustive and mutually exclusive but I could recalculate proportions excluding that category. Not sure how much that would bias my results. that been said, your analysis is really cool! Thanks! A lot of people have suggested that Stack Overflow is nicer (which aligns with my own experiences) but that still doesn’t explain the growing proportion of non-responses. The pissyness on the R mailing list was the reason I didn’t use R. Now that StackOverflow has an R tag I use R for everything (having abandoned matlab) and ignore the mailing list completely. This is cool. Very well done. One additional way to slice the time variable would be to look at cohort effects by making the X axis “Date poster first observed posting” Or just split folks by whether or not they were around before 2005 and then compute the proportion of comments over the last five years that were unhelpful for each group. When I grade the homework as TA, I deduct 0.5pt for each plot with so tiny labels that I cannot read. You lose 2 points for this post. I do not know how you managed to make all the axis labels consistently small. They do not seem to be from png().